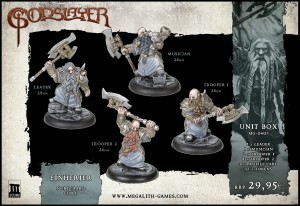 Megalith Games has another preview up for Godslayer with a look at the Norgaard Einherjer. The Einherjer represent the elite fighting force of the Gøderguard; a militant order dedicated to the worship of Nordgaard's founding hero-god. Across Ghorn, hardy Dwarves make the journey north to the land of permanent ice, there to take vows, and earn their place in the feast-hall of the god Haldan in the afterlife. Armed with poleaxes and equipped in blessed armor, these warriors constitute an elite melee unit of the Guilds sub-faction - one which is decisively useful for any Nordgaard warband. Feast your eyes upon these awesome sculpts by our friend SCIBOR.